Verify that the topologies bundled with HCP are deployed. From Ambari, navigate to Storm > Quick Links > Storm UI. Check that the enrichment topology has emitted some data. 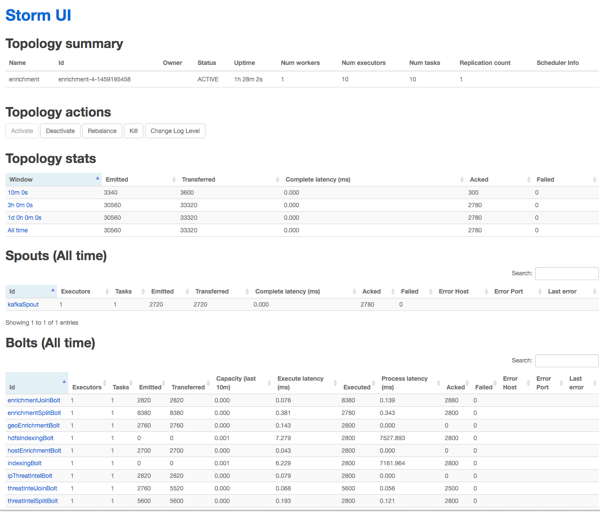 Ensure that the Metron dashboard is available and receiving data by displaying the dashboard at $METRON_UI_HOST:5000. Check to ensure that the indexing is done correctly and the data is visualized. Check to ensure that some data is written into HDFS at /apps/metron for at least one of the data sources. Customize HCP to meet your own needs.